The fact that the Earth Defense Force titles have been consistently localized is a little weird when you really think about it; after all, they’re part of a budget-priced “Simple” series in their native Japan. They’re basically the equivalent of those generic, derivative titles that get dumped into the clearance pile at your local big-box store, and yet they’ve somehow earned enough of a following to justify their translation for Western markets. Perhaps that’s because — like the goofy monster B-movies of yore, and so-bad-it’s-good pictures like The Room and Miami Connection — there’s just something infectious about the effort (or lack thereof) that goes into something this unabashedly lame. 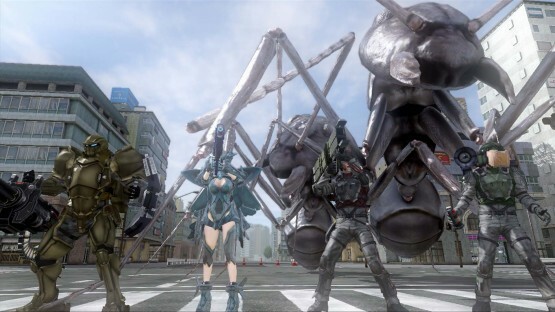 Yeah — Earth Defense Force 4.1: The Shadow of New Despair, a remastering of last gen’s Earth Defense Force 2025, keeps things squarely in “lame” territory. That becomes obvious the moment you begin your first mission, when the game’s abysmal sound design threatens to burst your eardrums. It’s not exactly customary to begin a video game review by talking about the sound of all things, but this is such a glaringly weird aspect that we may as well get it out of the way: yes, the voice acting is hilariously cheesy, but its humor is thrown off a bit by just how irritating it is. As mentioned before, the auditory assault begins the very moment you start your first mission, when the series’ infamous “giant insects” begin attacking civilians. The civilians, understandably upset as they are mauled and eaten, scream in terror; as you approach to offer some help, your EDF companions on the mission spit out random flavor dialogue. There’s nothing inherently annoying about either of these aspects — on the contrary, it’s clear that a good deal of effort went into making the voice acting as joyfully hokey as possible. XSeed’s localization evokes memories of the best-worst old monster movies, with the over-the-radio voice of your commander declaring his constant shock and horror at the increasingly absurd hordes of kaiju and mecha, and your companions uttering a handful of truly cheesy one-liners (“Eat this bullet!”). Unfortunately, all of this is hard to appreciate thanks to some lackluster audio mixing — even if you turn the voices’ volume down in the settings, there’s a cacophony of spoken lines all competing for attention at the same decibel, making it hard to discern individual speakers. To make matters worse, some lines will cut out before they’ve been finished. The end result is more headache-inducing than funny, and it wouldn’t be a surprise if some players opt to turn the voices off altogether. All right, so that aspect of the presentation doesn’t work, but at least the game itself delivers on its premise of goofy fun. 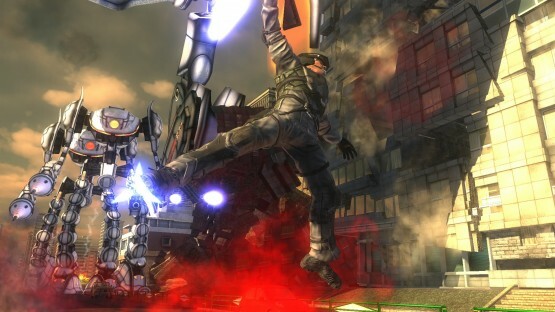 The EDF commander’s strategy consists of one undiplomatic option (“We have no choice but to destroy it!”), and the game follows suit on a similarly mindless note. This is run-and-gun, shoot-em-up action at its, er, purest, which means that — in absence of real strategy or variety — your mileage with the game will largely hinge on a) your ability to enjoy repetitive solo action or b) your ability to round up some friends to laugh at the absurdity. Sure, you do have some options when it comes to character customization; there are four different classes (super-strong Rangers, high-flying Wing Divers, attack-coordinating Air Raiders and dual-wielding Fencers) and a number of different weapons to collect and equip, but the end goal requires little thought. Fire away, and blow those bugs sky-high. As you do this, you’ll notice that the game prioritizes visceral action over any sort of polish. Graphically, things here are barely on par with a PS2 game, and there hasn’t been a whole lot of thought put into the generic environments and creature designs. That’s probably because they spend most of their time being obliterated; as enormous destructible set pieces and bug heads crash down around you, you can feel free to walk right through all of them. Don’t worry too much about those screaming civilians, either — they seem to have the magical ability to become invisible at will, and no matter how many times you blast them with a rocket launcher, they’re able to dust themselves off and walk away. On the other hand, do be wary of the giant spider enemies, whose webs have apparently developed to a point where they can go through buildings to reach you. If this all sounds a bit sarcastic, that’s because it is: with so many graphical hiccups and collision issues, the free-for-all anarchy is hard not to mock. If you’re of a certain mindset, though, all of this is just more reason to jump in and start laughing. Earth Defense Force 4.1: The Shadow of New Despair is amazingly dumb, which is exactly the reason the series became such a cult hit in the first place. The dialogue and voice acting are awful, the sound mixing is abysmal, the graphics would have seemed dated two generations ago and the gameplay is a simple exercise in mindless destruction. But as with all glorious garbage of this nature, there’s a certain je ne sais quoi about the way it comes together — or rather, fails to come together — that makes it perfect for multiplayer hilarity. Leave your brain at the door and you’ll probably have a good time. 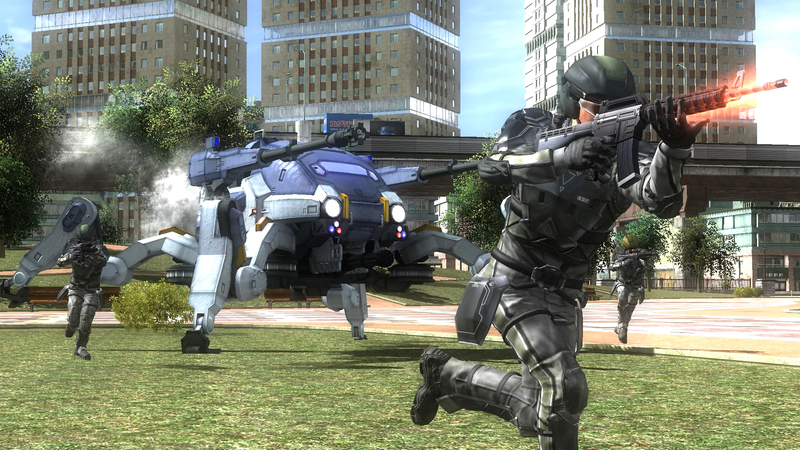 Review copy for Earth Defense Force 4.1: The Shadow of New Despair provided by publisher. Reviewed on PlayStation 4. For more information on scoring, please read our Review Policy here. Collision detection? What collision detection?